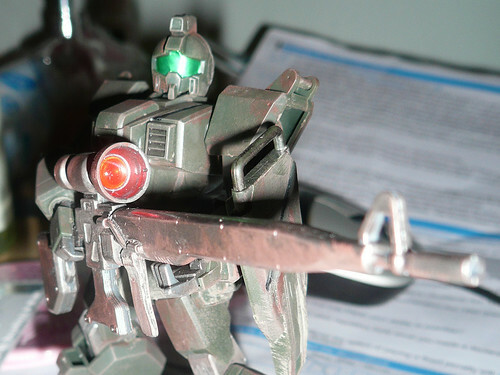 Tubbygaijin.com » HG 1/144 GM Sniper – Review! 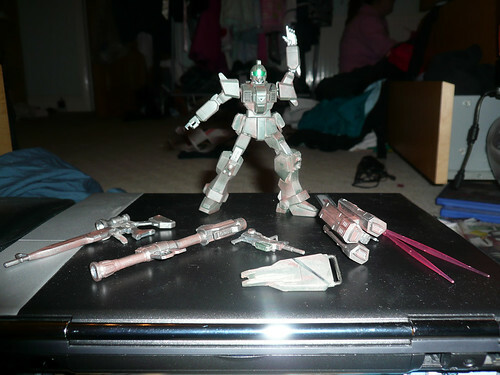 HG 1/144 GM Sniper – Review! 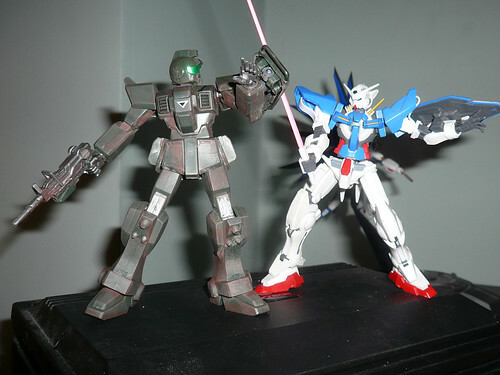 This is the first Gunpla i’ve built in ages, it’s a fairly old 1/144 kit I purchased when I was in Japan last month but on the plus side it’s a GM Sniper, as featured in the 8th MS Team OVA – one of my favourites. I’ve spent quite a while detailing this guy to make him look weathered and battered from long missions in the back of beyond. Hoping to improve this technique and finally build my MG Zaku ver 2.0 with similar styling soon. Mobility of this unit is pretty good considering the bulky nature of its armour, it’s mainly a gunner so no need for it to be capable of performing any crazy acrobatics anyway! The joints seem a little free at the mo so i’m going to try and tighten them up a bit somehow. One thing this unit really has going for it is the weapons, this is one of the most tooled up mobile suits i’ve come across! Left to right in this picture we have the GM Sniper Rifle, Bazooka, Machine Gun & Shield, Rocket Launcher and 2 Beam Sabers, fantastic! It comes with a set of hands for each weapon too so no fiddly swapping between every time you fancy a pose change. I’m left wondering what the MG version of this unit has to offer – and I think I need to find out! Click through to flickr to see larger shots and the love i’ve put into this, enjoy!